Music: Sir John Goss (1800–1880), and others. 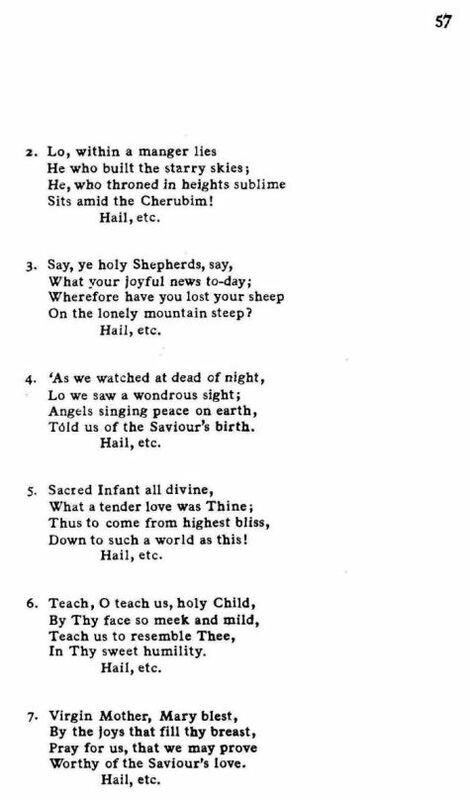 Source: Edward Caswall, The Masque of Mary and Other Poems (London: Burns and Lambert, 1858, 1877), Carol #XLII, "Hymn for Christmas," pp. 259-260. Christ is born in Bethlehem ! Sits amid the Cherubim ! On the lonely mountain steep ? Told us of the Saviour's birth." Down to such a world as this! Worthy of our Saviour's love. 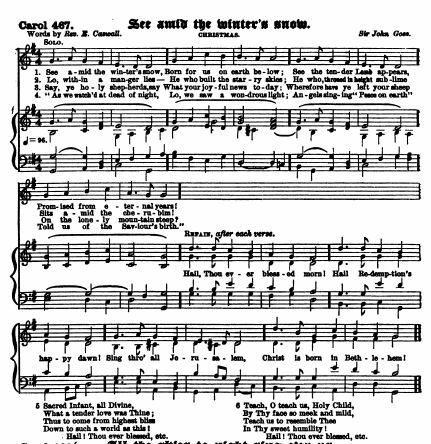 Sheet Music by Sir John Goss from Henry Ramsden Bramley (1833–1917) and John Stainer (1840–1901), Christmas Carols New And Old. Series Number. 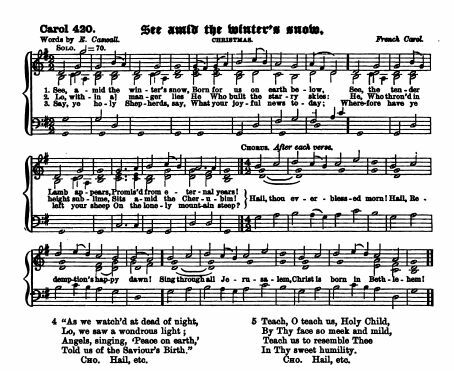 (1871), Carol #30, "Hymn for Christmas Day." Sheet Music by R.A. Smith from Hutchins, # 142. Sheet Music, a French Noel, from Hutchins, # 420. Sheet Music by Sir John Goss from Hutchins, # 467. 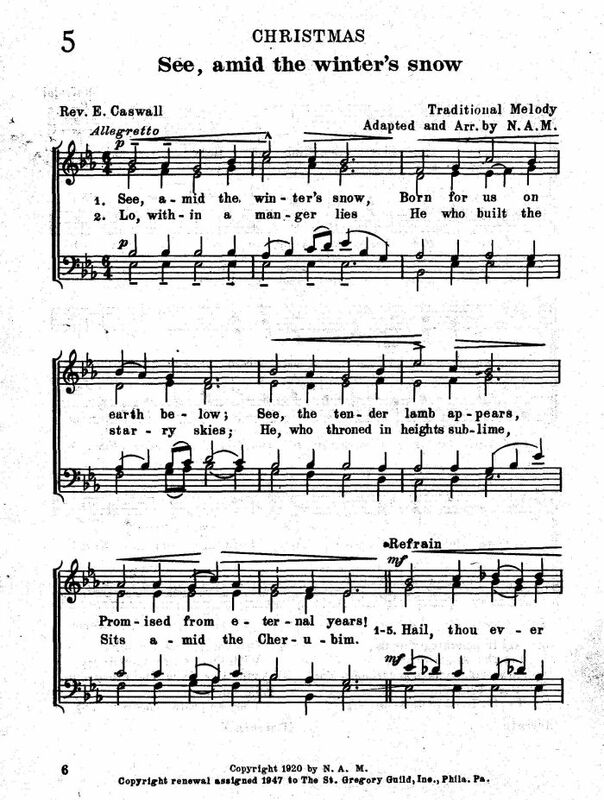 Sheet Music from Richard R. Terry, Old Christmas Carols. Part One. (London: Burns, Oates & Washbourne Ltd., n.d., ca. 1923), Carol #23, p. 29. 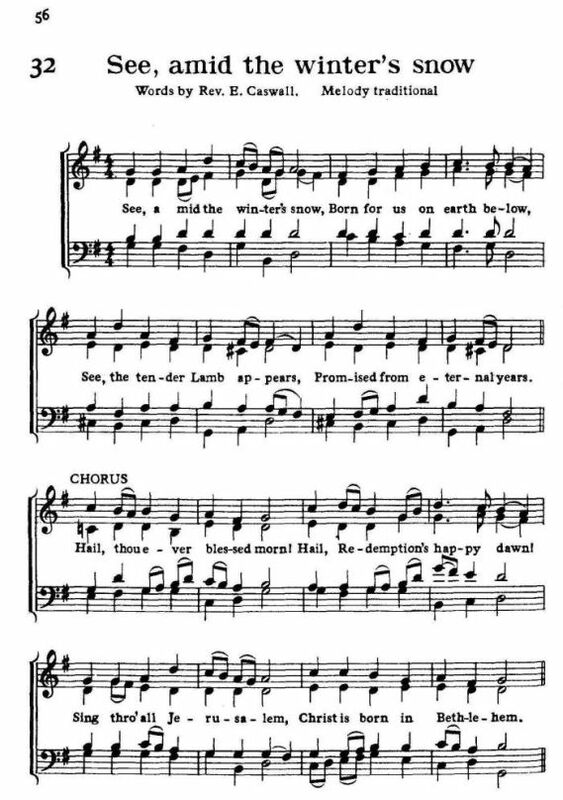 Sheet Music from Richard Runciman Terry, Two Hundred Folk Carols (London: Burns Oates & Washbourne Limited, 1933), #32, pp. 56-57. Note from Pettman: No. XV. —An alternative tune will be found in Novello's collection. This is intended only for congregational purposes. 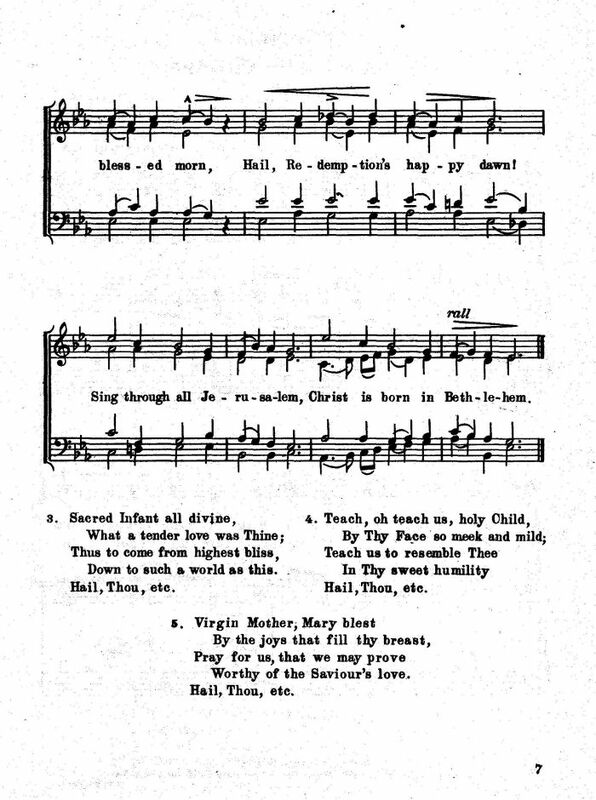 Sheet Music from Rev. Edgar Pettman, ed., The Westminster Carol Book (London: Houghton & Co., 1899), No. 41, p. 55. Sheet Music from St. Basil's Hymnal, 12th Edition. New York, Benziger Brothers, ND. 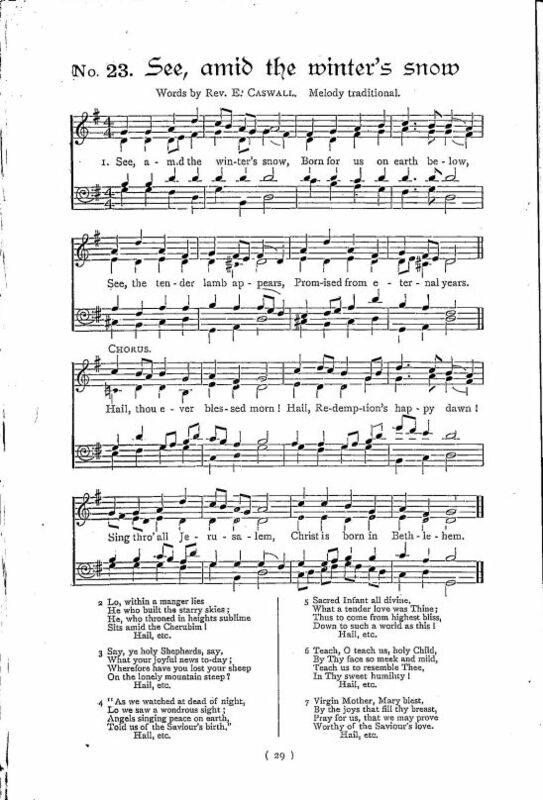 Sheet Music from Nicola A. Montani, ed., The St. Gregory Hymnal And Catholic Choir Book. Philadelphia: St. Gregory Guild, 1940, #5, pp. 6-7. 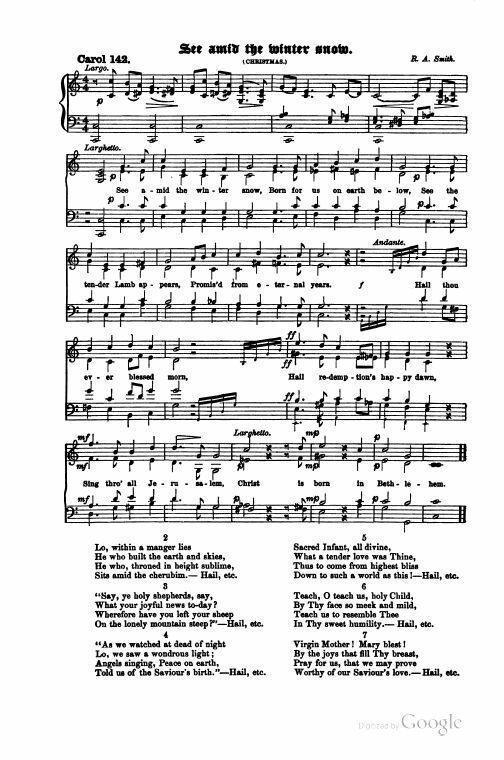 From very soon after it was published, to today, editors have gladly included this thoughtful carol in Christmas carol collections and hymnals. 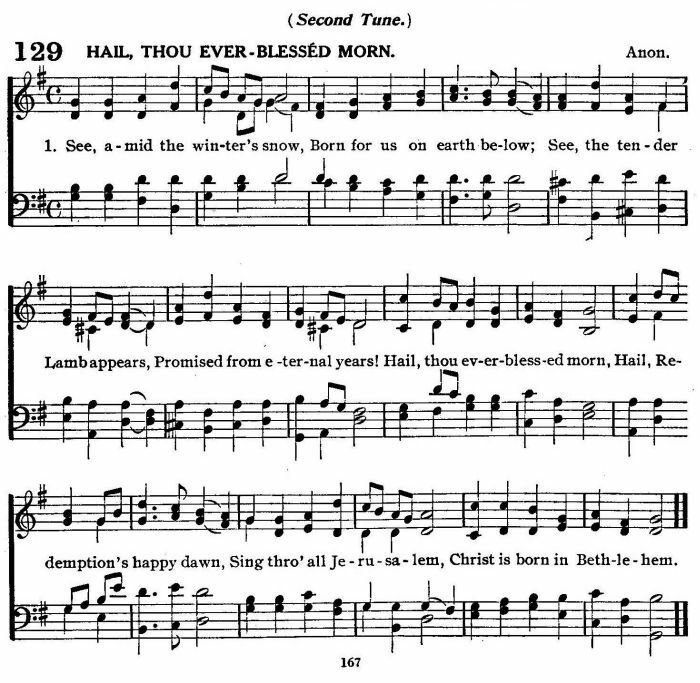 Although the setting by Sir John Goss is most frequently heard, other settings have been written for this carol. 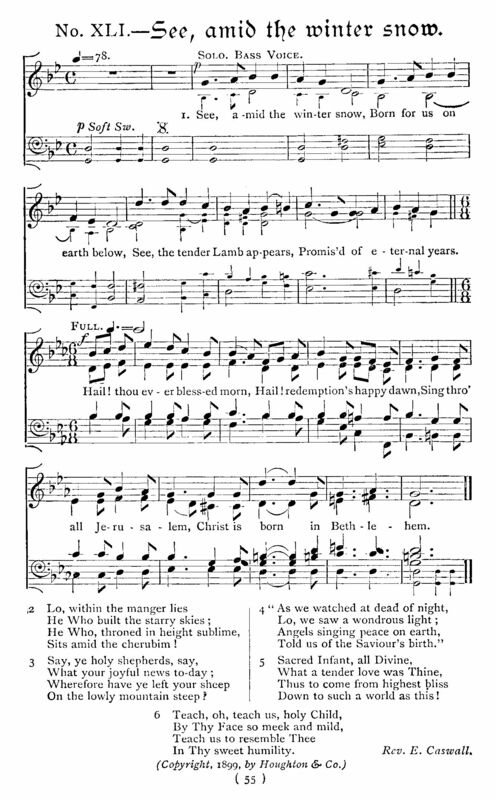 It first appeared in John Richardson, ed., Easy Hymn Tunes ... Adapted for Catholic Schools (1851). It was then soon published in a book of his verse, The Masque of Mary, and Other Poems (1858). 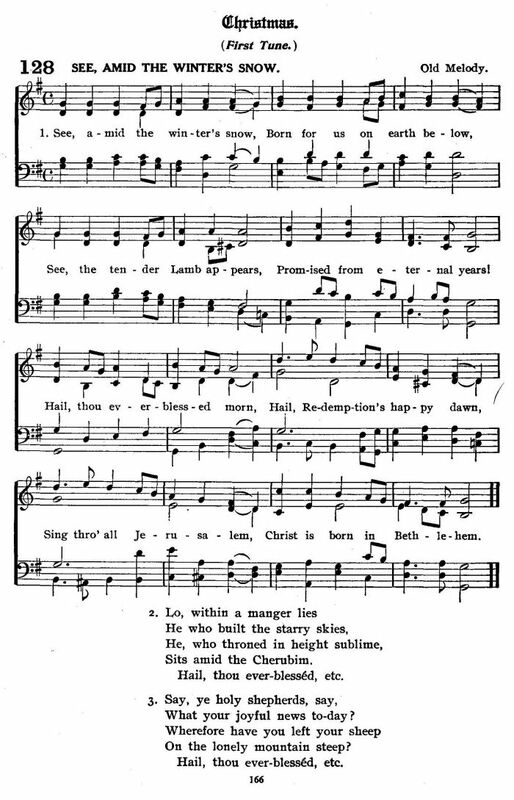 After that, one of the first hymnals to include this carol was The Catholic Hymnal. Hymns Selected for Public and Private Use. 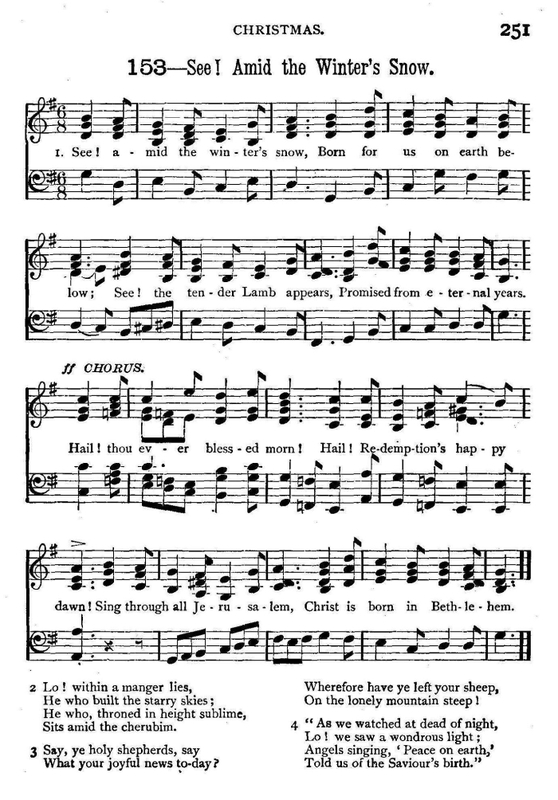 (London: Burns & Lambert, 1860), Hymn #83. Seven verses. No music. 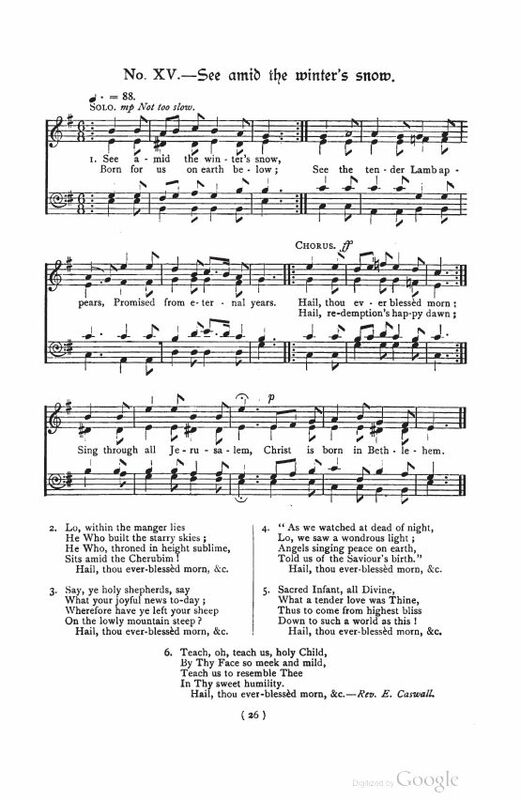 Others would soon follow including St. Dominic's hymn-book (1882) and Augustus Edmonds Tozer's Catholic Church Hymnal (1905), Hymn #8, with music. Rev. Edward Caswall (1814–1878). Oratorian and poet, b. 15 July 1814, at Yately, Hampshire, of which place his father, the Rev. R. C. Caswall, was vicar; d. at the Oratory, Birmingham, 2 January, 1878. He was educated at Marlborough Grammar School and at Brasenose College, Oxford, where he was Hulme exhibitioner. Before leaving Oxford he published, under the pseudonym of Scriblerus Redivivus, "The Art of Pluck", in imitation of Aristotle, a witty satire upon the ways of the careless college student, which still has a circulation. To the eighth edition, in 1843, he wrote a special preface of regret for certain passages, now excluded, which, at that later date, he had come to regard as irreverent. In 1838 he was ordained deacon, and in 1839 priest, in the Church of England. In 1840 he became perpetual curate of Stratford-sub-Castle in the diocese of his uncle, Dr. Burgess, Bishop of Salisbury. In 1846 he published "Sermons on the Seen and the Unseen", a volume of thoughtful discourses marked by the same tender and fervent piety found in his well-known hymns, and by a clear leaning to certain elements of Catholic doctrine. Soon afterwards, having come under the influence of Cardinal (then Dr.) Newman and the "Tracts for the Times", he resigned his curacy and, in January, 1847, was received into the Church by Cardinal Acton at Rome. In 1849 Caswall's wife, who had also become a Catholic, died suddenly of cholera, and early in 1850 he became an Oratorian. In 1852 he was ordained priest, and lived at the Oratory until his death. He was buried at Rednal, in the private cemetery of the congregation, near the grave of Cardinal Newman. Besides various manuals of devotion, several of which he translated from the French, his principal works are: "Lyra Catholica", a translation of all the Breviary and Missal hymns with some others (often reprinted; last edition, London, 1884); "The Masque of Mary and other Poems", original poetry, thoughtful, imaginative, tender, and full of zealous faith, a book which drew from Cardinal Newman, in return, a remarkable poem addressed to the author (reprinted several times; last edition, London, 1887); "The Catholic's Latin Instructor in the principal Church offices and devotions" (frequently reprinted; last edition, London, 1897). Source: Warren, Kate Mary. "Edward Caswall." The Catholic Encyclopedia. Vol. 3. New York: Robert Appleton Company, 1908. 14 Oct. 2013 <http://www.newadvent.org/cathen/03417a.htm>.